Estonian Kelly Sildaru became the youngest halfpipe world champion of all time by clinching gold at the 2019 FIS Snowboard, Freestyle and Freeski World Championships in Utah on Saturday, informed LETA/BNS. The gold medal is also the first World Championships medal for Sildaru in the non-junior division. The 16-year-old from Tallinn upped her level from run to run as she pushed for gold, eventually becoming the youngest halfpipe World Champion of all time with stunning performance in her third and final run. 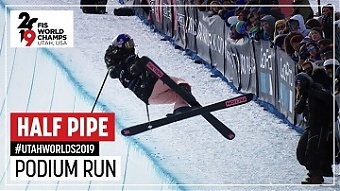 Sitting in third place before dropping in for her gold medal-winning effort, Sildaru decided to throw everything she had left in tank, putting down the first switch 1080 ever performed in competition by a female rider on her last hit, the website fis-ski.com reported. The judges rewarded her with a high score of 95.00 points. Canadian freeskier Cassie Sharpe, top qualifier and reigning Olympic champion, who had been throwing the biggest and most stylish runs of the competition up to that point, had to settle for the second spot for her second World Championships medal with a best of 94.40, while the US favorite Brita Sigourney rounded out the ladies’ podium in third with 90.60.